Hannah greets us with a face lick, Booker climbs in our lap, Max cuddles with his forehead. We call it “bulldozing” as he leans his weight into one of us, through his forehead. In the US most people think Booker is our cutest dog - and he is probably the cutest dog who ever existed, so I can understand why. But in Mexico, Max gets all the attention. People ask us if he is xoloitzcuintle so often that we now believe he is. 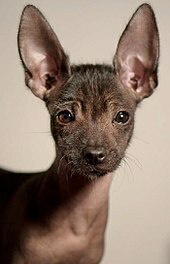 Xoloitzcuintle is the oldest and most recognizable “Mexican” dog (other than maybe the chihuahua), also known as Mexican hairless. It’s the national dog of Mexico, too. Not only did Aztecs, Mayas and other cultures in this region revere the breed for companionship, security and hunting, the Aztecs ate them in ceremonial feasts. At age 14, Max is the oldest member of our family and hoepfully doesn’t look tasty anymore. He actually looks pretty strange, with huge bat ears, long scars across his back and chest, barely any hair and snaggle teeth. He looks REALLY weird for an Italian Grayhound, his official breed (e.g., Booker). Max is the friendliest four-legged in our family. Here he greets our neighbor Torce. Max is thrilled to meet every person or dog. He’s indifferent to all other life, and he’s pretty much blind so he tends to ignore everything but food, us and visitors. We used to say that he invited the flies over when he was lonely, but lately he wants to have a blanket over him all the time - even in the heat of afternoon - and I think it’s because he doesn’t like bugs landing on him. Smart dog, right?! So we cut up a fleece blanket into five pieces and toss a section over him wherever he is. This also helps catch poop smears. Max has gastritis and often poops 10+ times a day. In PA this was often in our apartment (thankfully not on the carpet) but in Mexico he always poops outside. Sometimes on the sidewalk though, since the mornings are cold and no one likes getting their feet wet. Max has neuropathy and stiff muscles. We used to pick him up ever-so-gingerly and still at times he’d cry out. He’s more nimble and less sore than ever, more evidence that he is a Mexican dog. In PA if we were walking to the neighbors or hiking in the backwoods Max often took himself home. He’s gone on hikes with us in Mexico, only occasionally looking back. Max is more cuddly than ever, and prefers to nap on/against me all day and sleep on/against me all night. This day he was my laptop. Even in Mexico Max is unsteady on his feet. We worry about him when we’re bouncing and rocking around in the truck, but he usually stands up and foreheads one of us. Once he sat on a jar (we’d brought kefir for a snack) and we laughed so much we could barely get this photo. Of all three dogs, Max is hardest on our sleep since he often wakes up gagging/puking (gastritis) but the easiest all day, since he is independent and doesn’t cry (Booker) or chew up our shoe racks (Hannah) when we’re gone. Max is the only one of our dogs to ever bite us, but it’s more like getting gummed since he has so few teeth left. This rarely happens (esp since he’s so happy here) but every couple months if I’m trying to clean the thick grime from his ears or he gets scared at the vet he cries out and nips. But then other times he’s too passive! The patience of a saint! (with Fly). It’s wonderful that he’s more “at home” in Mexico (than PA).